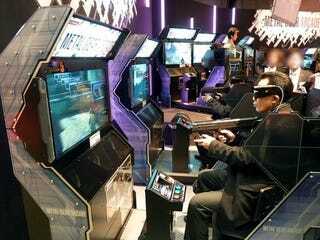 First revealed at 2009's E3 gaming expo, Metal Gear Arcade is still under development. According to Konami, the game is getting one more "location test" in arcades for the general public. One more? That seems to indicate that 3D game is finally edging towards an official release in Japanese arcades. The game was originally supposed to be out in 2009. There were Metal Gear Arcade location tests this past summer in Japan, but a release date was not made public. The location test will be between November 19 - 21 in Tokyo Leisure Land in Akihabara and feature new missions.